Last night, Rose and I went to see John Hodgman interview Neil Gaiman at FIT. Hodgman was hilarious as ever, remarking in his introduction vis-a-vis the necessity of introducing Neil Gaiman in a room of Neil Gaiman fans that "It's as if you were all lined up in the desert at an oasis, and I said, 'Before you drink, let me tell you something about this oasis.' You would all hate me." He and Neil chatted for a good long time, and before a few questions from the audience and the very well-organized book signing portion of the evening, Neil read two poems from his new short story collection. Apparently so many fans sent him letters expressing their utter lack of interest in (or antipathy toward) the poems included in his last short story collection, he very nearly left them out of this book. But then he thought, "Well, the poems won't make the book cost any more...dammit, I'm putting them in." My favorite quote of the evening, though, was when Neil remarked, "I don't ever think 'Oh, that tie would go nicely with that shirt' so much as 'This T-shirt is a comforting shade of black." I am happy to offer Neil my shirt-and-tie matching services, should he ever need them. 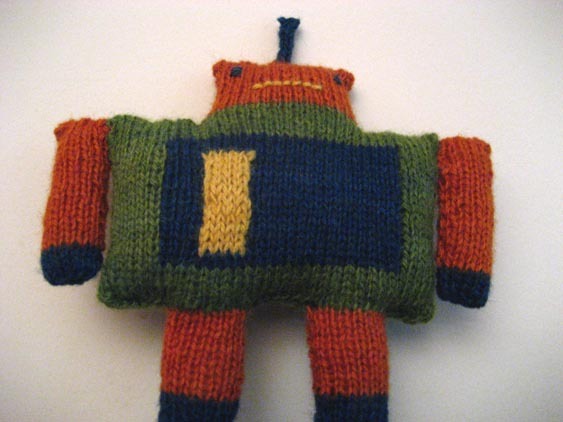 It is ready to crush the world...with love! Note that the days of the week are all correct (and note also that I am obsessive enough to have checked them all). Anyway, I wonder if the dates will continue creeping further and further into the future. 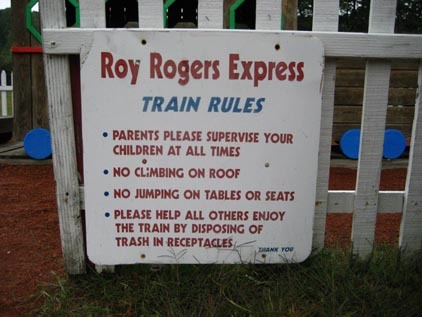 More on this as whim permits. I think some variation on that might not go amiss on the subway. I have a backlog of other photos that I've been meaning to post. Here are two (taken by Rose) from my recent set at the Slipper Room: Adam Izetelny backing me up on bass as I sing "Your Favorite Song" (which I hope to record an MP3 of at some point), and Lorinne singing lead on "Dear John" (available here with me singing instead). Rose and I went to see the corpse flower at the Brooklyn Botanic Garden when it was blooming, and we took pictures of it, but everyone was getting hustled through the greenhouse pretty quickly and the photos aren't as impressive as they might be. But I did get this excellent picture of a dragonfly while we were there. Before our visit to see the corpse flower, Rose and I were in San Antonio for the yearly National Puzzlers' League convention. Our first picture, naturally, was of the Burger King banner by the airport shuttle to Newark, which, Rose noted, seemed a tad desperate in its attempt to appeal to members of today's plugged-in culture. One of our afternoons in San Antonio was spent wandering from museum to shop to gallery to other shop to other museum in the downtown area, including the Alamo, which is just as uninteresting as you think it is unless you are predisposed to be interested in the Alamo. I was much more entertained by the cheesy Buckhorn museum, which was filled with taxidermified two-headed calves and wax figures and beer bottles and all manner of random stuff, including this face shot into a sheet of metal by a sharpshooter. There was also one small gallery in which the proprietor never stopped talking. We'd look at a print of a lithograph by Dali that was on sale for some (not unexpectedly) exorbitant amount of money, and he would tell us that Dali was a very famous painter known for his fantastical, surreal images, and so forth. This sort of thing went on with everything we looked at, sending the clear message that he considered us to be a pair of bumpkins who had not even the slightest knowledge of art whatsoever, and needed everything spelled out for us. This made us want to avoid looking at any of the art, lest he find more to tell us. In the back of the gallery was an old card catalog cabinet with a bikini-clad plastic girl posed in one drawer. We thought this was charming and asked if he'd mind if we took a picture of it. He immediately mocked us, saying, "Why would you want to take a picture of that? All this art, and that's what you're interested in? Well, go ahead, if you want." We wasted no time in leaving after that. On another day, we visited the San Antonio Botanic Garden. I won't try posting all the shots from there that I liked, but I am particularly fond of this butterfly photo. (The butterflies were one of the most memorable things about San Antonio -- they're small, but there are tons of them! Everywhere! At one point, we were surrounded by a cloud of them.) Also at the garden, there was this; I like to call that photo "Site of Future Historical Marker". Oh, and, of course, leave it to me to go to San Antonio just to take a picture of a bunny statue. Before that, Lorinne and I had a jaunt to the Coney Island Aquarium, where we checked out jellyfish and discovered that no matter how creepy you think crocodiles (or alligators, or whatever) are, they're creepier when you can see them standing up underneath the water. But I'll always remember the Electric Signal of Mormyrid, which we thought sounded like some sort of quest object in a poorly written fantasy novel: "We seek the Electric Signal of Mormyrid, for the mystic light of the Orgel Lamp of Ikea doth grow dim!" I think that's about all the photos I wanted to post. I'll leave you with one more photo from the Brooklyn Botanic Garden: a somewhat disturbing koi feeding frenzy at the pond in the Japanese Garden. You may be aware that Amazon allows users to apply tags to items, and that shoppers can then search by those tags. So, for instance, two people tagged Snakes on a Sudoku with "snakes on a plane"...and one person tagged it "wtf". A few other items share that tag. You may enjoy browsing them. This will make programming seem cool...because, seriously, what do teenagers love more than skiing? The very rare stabbed-in-the-face Lincoln penny. Just follow an arrow. Any arrow. 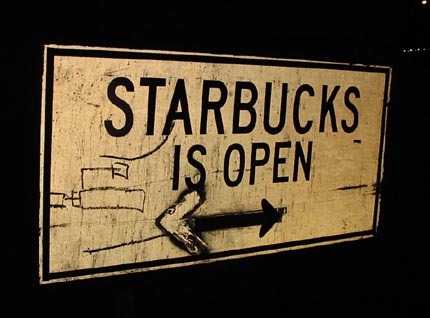 Here's a photo to soothe you in those troubled times when you wonder, "Is Starbucks open?" Any vague curiosity I had about whether I might prefer the new Microsoft MP3 player to another iPod has been burned off with the discovery that the Microsoft Zune adds DRM to every song you store on it. I tried highbrow once. It didn't sell. "World's worst tie-in." I feel strangely proud. "Humiliation aside, the system worked." 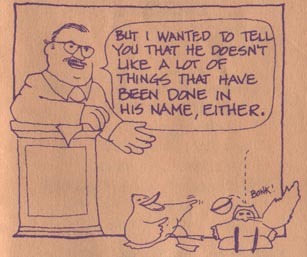 In these troubled times, when the liberal media routinely denies airtime to its political opponents, it's really quite unfair that I've been ignoring the work of cartoon commentator Sean Delonas for so long. I wonder what he's been up to lately. 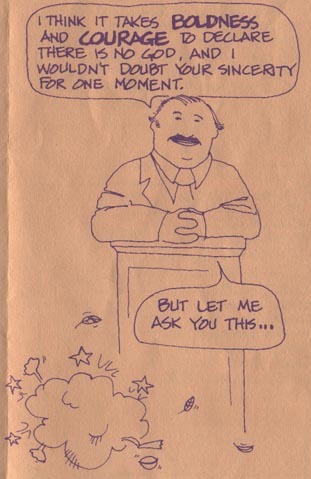 Gosh, when I look at his editorial cartoon for September 10, it's like no time has passed at all. Today's isn't much better. Not that Delonas would likely have listened to Clinton's side of the story if ABC had given Bill the opportunity to give a speech in the middle of "Path to 9/11". Once I get past my initial reaction (Smoking in space! Ha ha! Good luck getting a decent draw off that! 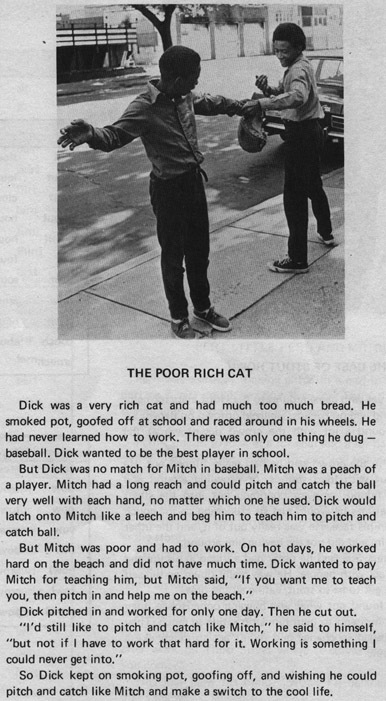 ), I find that I have a lot of questions. Are we, in fact, on another planet? The caption implies we're on Earth. 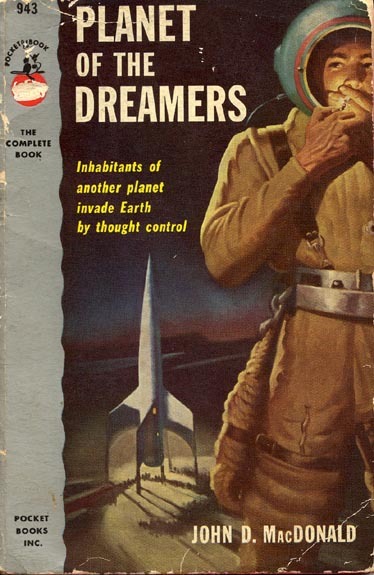 But if we're on Earth, why is the guy wearing a spacesuit? Unless he's actually an alien...but do aliens carry cigarettes? And since when do spacesuit helmets have no glass in the front? So many questions. I guess that's why they call it speculative fiction. For more fun in space, watch this (innocuous) or this (highly suggestive, language NSFW). Are you ready to sway disaffectedly? I said, ARE YOU READY TO SWAY DISAFFECTEDLY, NEW YORK??? If you live in New York and have no plans for tomorrow night (and you probably don't, because who makes plans for Tuesday night? ), you might want to come see Dirty Lenin play the Slipper Room (mostly NSFW show flyer here). The opening act is a variety show, for which I'll be playing a few songs (with Lorinne taking lead vocals on one of them)...but if that's not enough for you, there are also, according to Dirty Lenin's e-mail bulletin, "amateur stripper/s"; I take that slash-S at the end to mean "hopefully more than one, depending on our powers of persuasion". Rest assured that I will not be one of them, in any case. Variety show starts at 8:00; Dirty Lenin goes on at 9:00. Another band (The Break) follows. See you there, perhaps. I'd like to know how this search led to my blog. Then there was the person searching for a "crossword maker with more than 21 words". I think you might want to set your sights a little higher than that if you want to write crosswords, sir (or madam). The other night I dreamed I was standing on a balcony with Jesus. We were looking out at the world, and he said, "This is great! The whole world is Christian now! How did you do it?" I shrugged and said, "I sold our souls to the devil." He slapped his forehead, rounded on me, and shouted, "You idiot!" The headline fated to launch a million hack jokes: "Manilow doing well following hip surgery". Rose poynteth me to Geoffrey Chaucer's reporte aboute Serpentes on a Shippe. 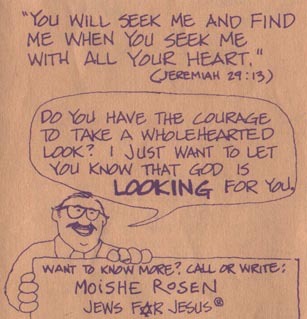 A couple months ago, Lorinne received a particularly entertaining Jews for Jesus pamphlet on the subway, which I commandeered (with permission) as blog fodder. I lost no time in neglecting to post it and then mislaying it, but I discovered it today while cleaning the apartment, and decided that its time was now. "You atheists are so cute, I could just pick you up and squeeze you!" I haven't even opened the pamphlet yet and already I'm being condescended to. Nice. 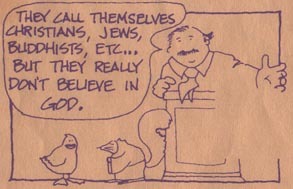 I like the (presumably atheist) duck, though. He's bringing out the glasses, so you know he's making a serious point. But not serious enough to put the glasses on, I guess. Nonetheless: oh snap! Did he just say that some religious people are atheists and they don't even know it? Oh no he di'n't! How can they fail to believe in god, who has the power to make body parts and podium components vanish into thin air? Such Christians are represented by a squirrel wearing the robes of a monk, as is traditional. Glasses on! 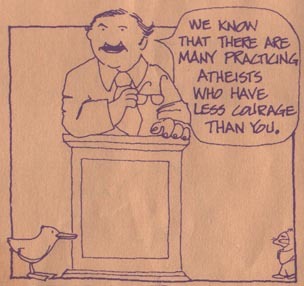 Quack on, my atheist brother! 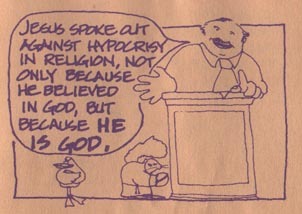 So...anyone who criticizes hypocritical religious figures automatically has enough credibility to claim to be god? The duck is clearly as impressed with your argument as I am. No, your nervous habit of constantly taking your glasses off and putting them back on is what's annoying me! And so he punishes the wicked by dropping nuts on their heads? 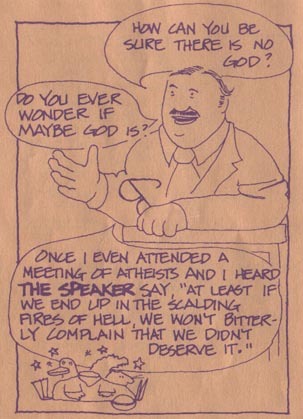 Theology is awesome. Ohhhhh, now the knives come out. How could an atheist ever hope to absorb the concept of a moral code? 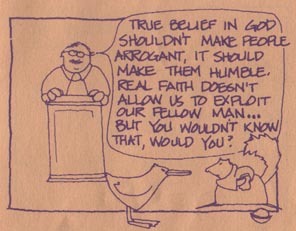 It's religious faith and only religious faith that prevents us from exploiting our fellow man. Squirrel. Duck. Note that the squirrel, too filled with pride, is preparing to whale the tar out of the duck for laughing at his mishap with the nut. Glasses off! 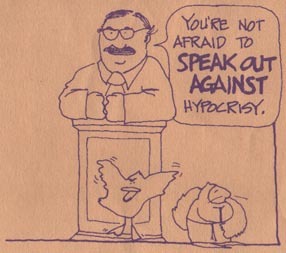 I think the lack of glasses symbolizes the man's bland indifference to the persecution the atheist duck is currently experiencing. Jews for Jesus: proudly persuading atheists to consider becoming agnostics instead. The duck is now tangled in the monk's robes, symbolizing his willingness to appear to agree with the smug man's proselytizing, if only it will shut him up. 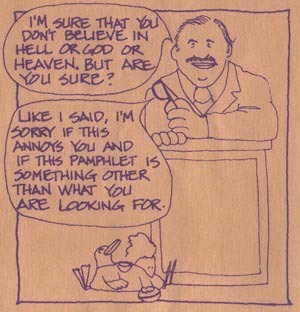 Um...yes, I'm sure that I also don't believe in heaven and hell. Translation of second balloon: "I'm hope I'm not annoying you by BLOWING YOUR MIND with TRUTHS YOU CAN'T HANDLE." 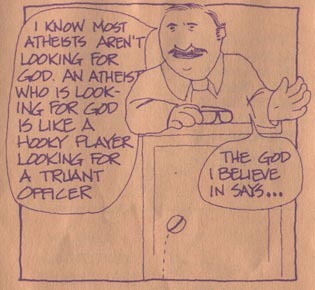 Except that hooky players believe in the existence of truant officers. Glasses still off, although kept constantly at the ready. See that nut that's been tossed back into the air? Care to guess what punch line it will lead to in the final panel when it falls? Please do, because that's the last we see of the nut, or the animals. Big finish! Glasses back on! 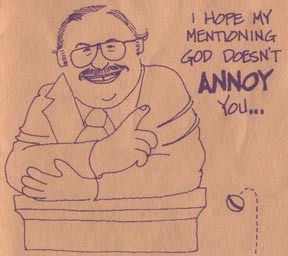 Anyway, my combover-sporting interlocutor, I think you'll find that most atheists have already considered the question of whether there is a god or not, since believing in god is kind of the default for just about everyone in the United States, and so becoming an atheist is almost always a matter of looking at what you've been taught to believe and deciding, hmmm, no, that doesn't make any sense; I don't believe it. And now that I'm done, I will hand the job of giving Jews for Jesus a hard time back to someone who can handle it much better than I can: Jackie Mason.